BERLIN – Following the harsh criticism leveled all over the world over the inclusion of the extreme right wing party LAOS in Greece's provisional government, the party's leader, Georgios Karatzaferis, is trying to retract some anti-Semitic comments he has made over the years. Karatzaferis told Greek television this week that "the Jewish Holocaust, which was carried out by Hitler, and the Armenian genocide, which was carried out by Kemal Ataturk, were the biggest crimes of the past century." Karatzaferis, 64, who has regularly addressed the "global Jewish-Zionist conspiracy" to humiliate Greece and control the world's economy and compared Israel to the Nazi regime, said this week that he has "often supported cooperation with Israel" despite believing that Israel has sometimes used "excessive violence." The politician's current rhetoric appears to be in direct contrast to a long line of anti-Semitic statements he has made in the past. During a televised debate with Israel's ambassador to Greece, Karatzaferis said: "Lets talk about all these tales of Auschwitz and Dachau"; in 2002 during a parliament session he asked the then Greek prime minister: "Is it true that your daughter secretly married a Jew? "; and during Operation Cast Lead in 2008, Karatzaferis said that the IDF was acting "with savage brutality only seen in Hitler's time towards helpless people." His conciliatory words may be connected to a secret telegram sent by the American embassy in Athens. Following LAOS' great success in the Greek general elections in 2009 (it won close to six percent of the votes), US embassy officials wrote that Karatzaferis realizes that in light of his party's growing influence, it is essential that it distance itself from ultra-nationalist positions and anti-Semitic rhetoric. The telegram was made public by the WikiLeaks website. According to a LAOS party member who briefed the US embassy staffers, Karatzaferis instructed the party's leaders to soften their anti-Semitic comments so Washington would not object to the party's inclusion in a future Greek government. The US embassy telegram referred to Karatzaferis as a "persona non grata" and, according to a US State Department report from 2008, he was not invited to formal embassy events due to his repeated denial of the Holocaust. While Karatzaferis himself does not serve as a minister in the current Greek government, two other LAOS party members have been appointed to senior positions. 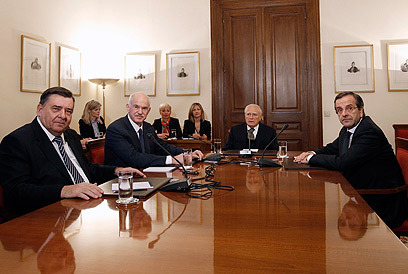 The extreme right-wing party's inclusion in the provisional government, which is expected to remain in power until general elections are held in the spring, drew harsh criticism, particularly from Jewish organizations in Germany, which is at the forefront of the efforts to help Greece recover from its economic crisis. The Jewish groups protested Berlin's willingness to negotiate with a coalition that includes LAOS. See all talkbacks "Anti-Semitic Greek politician softens rhetoric "